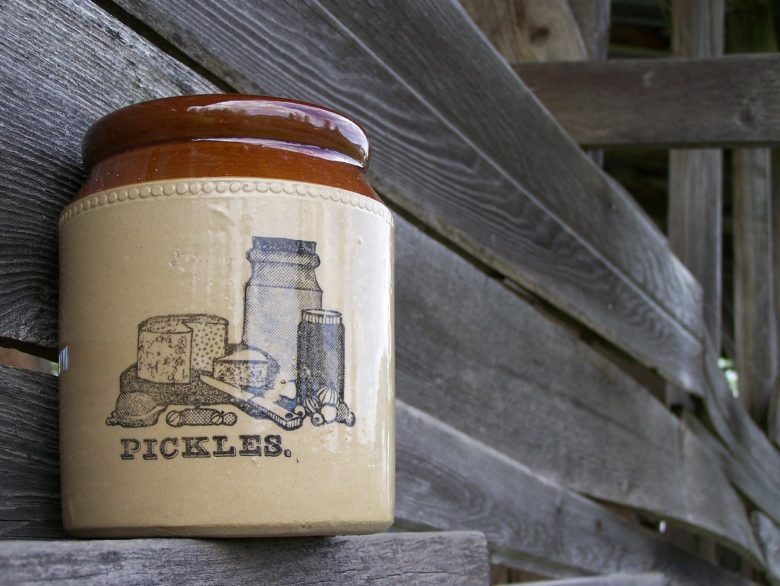 What To Buy: Pickling Jars, Fermentation Crocks Or Mason Jars? 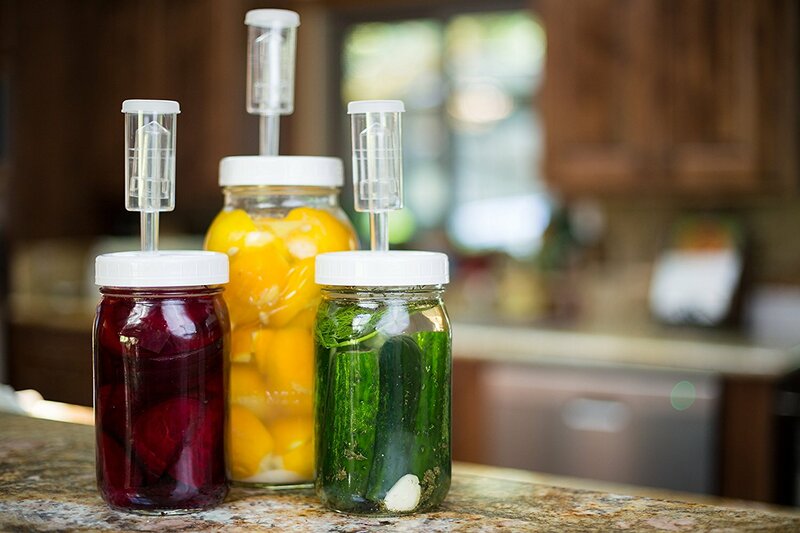 If you are new to fermenting or pickling your own vegetables or produce then there may be a number of questions that arise on what fermenting vessel you actually need. If you look online there a few different options, whether you decide to use a crock, airlock jar or regular mason jars it can be a tricky decision. What are the benefits of one choice over the other and does it make much difference to the final fermented food. In this article we are going to review the different types of fermenting and pickling vessels so you can decide which is the correct one for you. There are three main types of fermenting jar or crock to choose from when fermenting vegetables. Certain characteristics are desirable in any fermenting vessel you may choose. As an example, a wide mouthed opening is a must to enable you to get larger vegetables into the jar or crock and also to get your hand inside to clean it. A lid that allows the carbon dioxide created during lacto-fermentation out of the jar, but stops air from getting in is desirable. Size is also an important consideration as not only do you want to get the produce you are pickling and preserving into the vessel but you also need to account for brine and fermentation weights which must fit through the opening of the fermenting jar. To ferment and pickle vegetables we want a vessel that is non metallic and in the case of a fermentation jar able to form an airtight seal whilst at the same time are able to vent gas that is created during fermentation. There are numerous types of fermenting jars on the market that utilise an airlock as a means of allowing the carbon dioxide from fermentation to escape whilst not allowing air to get back in. 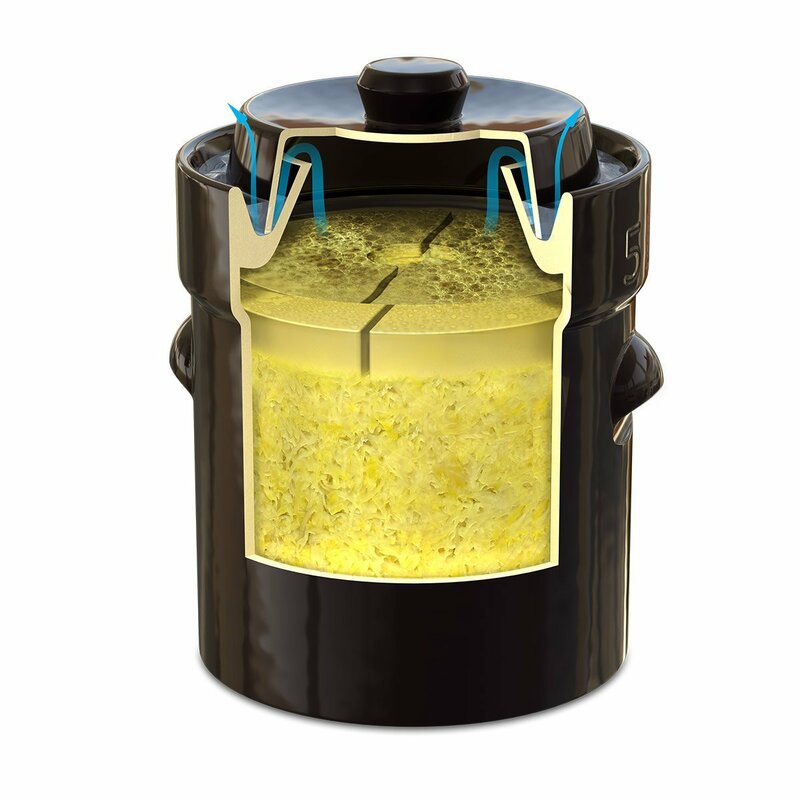 This stops any spoiling bacteria or mould spores that may be in the air from spoiling your ferments. The great thing about fermenting jars with an airlock is it really is a case of filling the jar, adding fermentation weights if you are using and attaching the lid. The ferment can be left for the period of fermentation without worrying about venting the jars or from mould or bacteria from getting into the fermenting jar. Typically an airlock can be attached to any jar as long as the lid fits and is airtight. There are many products on the market which are simply modified lids that fit onto mason jars or kilner jars that have a bubbler airlock. 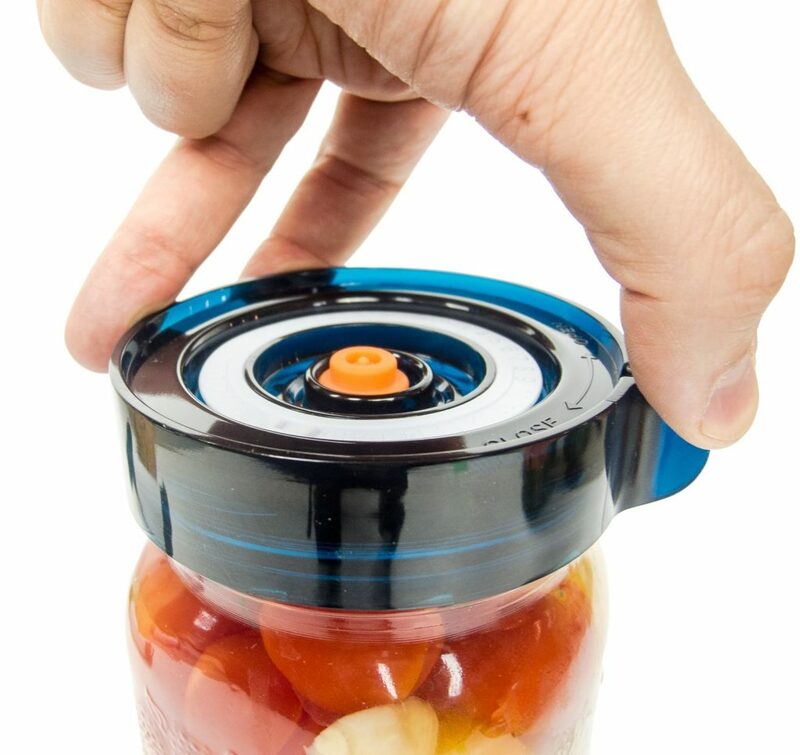 These lids allow you to make use of any jars you may already have and use them as fermentation jars. These types of fermentation jars work on the principle of keeping air away from the fermenting produce this is important as the air can carry in unwanted bacteria, mould or wild yeasts that will spoil a lacto fermentation. Lactobacillus, the bacteria responsible for preserving and pickling vegetables grow and reproduce anaerobically, meaning that they do not need air or oxygen to grow. An airlock will stop air from reaching the ferment whilst at the same time letting carbon dioxide that is created during fermentation out creating an environment that is very sanitary. Airlocks come in different types but all accomplish the same thing, letting gas out but not in. Bubbler airlocks are particularly good as they have a small amount of water in which visibly bubbles as it lets gas out, creating a visual sign of fermentation. Airtight design prohibits bacteria or mould spoiling the ferment. Visual signs of fermentation through airlock. 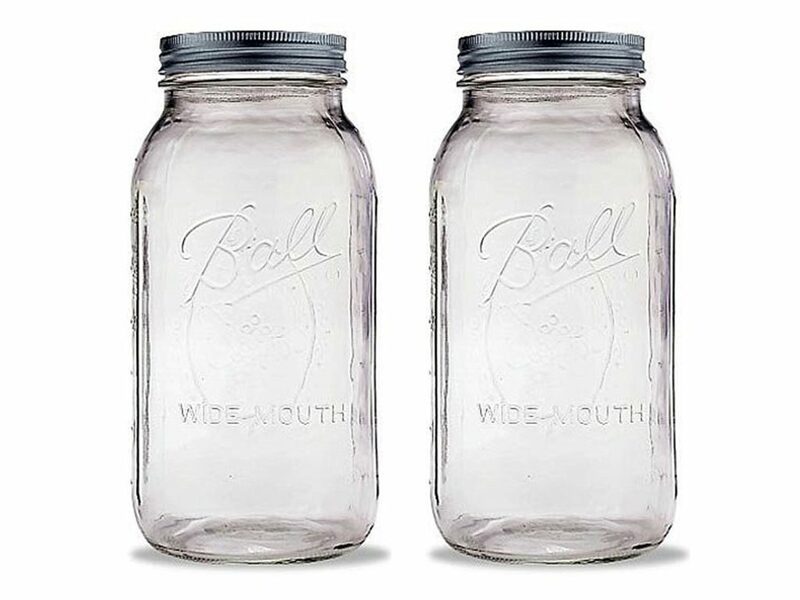 Lids can be attached to regular mason jars. Airlocks must be maintained and topped off with water. 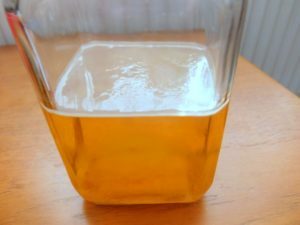 Brine can get drawn up into airlock if jars are overfilled. Both can be used to ferment and pickle vegetables however there are some distinct differences. Open crocks are open to the air which is what would of been used by most people many years ago. 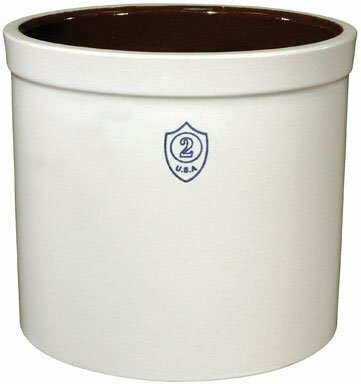 Open top crocks are cylindrical vessels with wide openings. They are not as common now as they were a while ago and more commonly used today as utensil jars or storage containers. 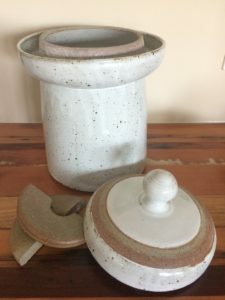 Open crocks can be filled with vegetables for pickling and are usually weighted by placing a plate on top of the vegetables and weighing down if necessary. 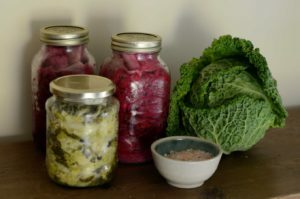 If you already have a open crock it can be used for fermenting but you will eventually need to jar whatever you pickle otherwise the ferment will be prone to spoiling or mould, simply because the fermenting vessel is open. If you have an open crock the best method for fermenting in it is to cover the opening of the crock with a cloth to stop insects or debris from falling in as well as allowing the ferment to vent carbon dioxide. Water sealed fermenting crocks are what I would recommend if you want to use a traditional crock to ferment or pickle vegetables. These are traditional pots that are usually earthenware with a lids that behave similarly to an airlock. Of all the fermenting jars and vessels you can use I feel that these fermenting crocks are the most aesthetically pleasing and wouldn’t look out of place on any kitchen counter, some handmade ones are almost works of art. The way a water sealed fermenting crock works is in the design. Around the mouth of the crock is a gutter into which the lid loosely fits, in the gutter there is enough capacity to add a small amount of water. When the gutter is full of water the lid forms an airtight seal whilst at the same time allowing any pressure created from carbon dioxide during fermentation to escape through the water seal. Most fermenting crocks with lids come with fermentation weights. Two half discs that fit in the crock keep the fermenting vegetables submerged for the duration of fermentation. Traditional and aesthetically pleasing design, looks great on the kitchen counter. Water seal prevents spoilage that can occur with open fermentation. Purpose made for fermentation and usually include weights. More expensive than most jars and other vessels for fermentation. Water seal needs to be monitored and topped up as necessary. Opening is usually slightly narrower because of the water seal gutter. The great thing about fermenting your own produce is that you can use or re purpose most jars that you have around the house. If you happen to buy jars of food from the store you could save these jars and buy fermentation lids like we reviewed above. Or, you can use regular mason style jars with screw lids. You will need to keep the jars vented as carbon dioxide created during fermentation will build up pressure inside a sealed jar. If you don’t vent pressure periodically for the first few weeks of fermentation there is a risk the jar or lid will fail. You can leave the lid slightly loose so pressure can’t build up and seal it later when fermentation slows. Apart from having to vent the jars there is no real difference in using a mason or kilner jar than a dedicated fermentation jar or crock. You always have the option of upgrading later on buy purchasing fermentation lids for your jars should you wish. When using a jar the only real consideration you need to make is the size of the jar and the opening size. The size of the jar determines how many vegetables or produce you can actually fit in and the opening size is important for the ease of packing the vegetables and also being able to fit a fermentation weight in the top. Cheapest option for fermenting and pickling. Readily available and can reuse store bought jars. Can be upgraded later on with fermentation lids. Need to be vented during fermentation. Narrow openings can make it hard to pack and insert fermentaiton weights.